Looking back on your race season is a learning tool, allowing you to access strengths and weaknesses, along with what worked well in training. Every race is a snapshot to where you are at mentally and physically with fitness and fatigue throughout the year. Learning from these race experiences and results will help you paint a picture of your season. 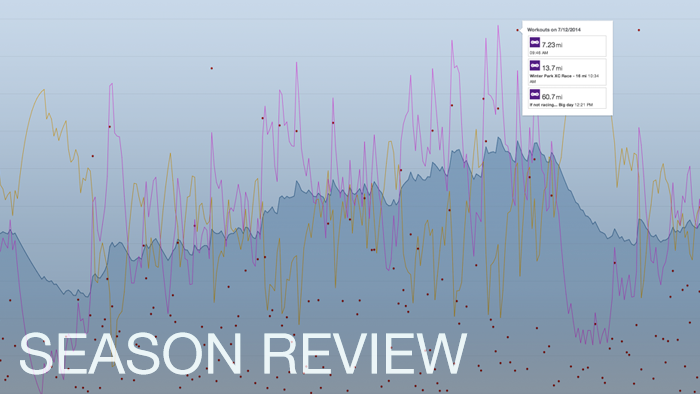 From here you can assess and compare training volume, intensity, timing, and recovery patterns. This will help you learn whether you did too much of one thing or not enough of another. Consistently addressing your weakness is how you improve, whether that is related to your physical skills, mental skills or with the structure of your program. It is hard to replicate in training what you experience in a race. A race, whether it is high or low priority, will always push your limits. This makes a race the best place to test for fitness and skill. It’s also the best place to recognize weaknesses. There are endless scenarios and variables when it comes to assessing race performance, but in general there are a few important things to look for and take note of. Struggling to cross the finish line could be related to a few issues. A lack of aerobic endurance is what most would point the finger at first, but it’s not always the case. Training with too much intensity or volume, too often, can also lead to poor race endurance with overly fatigued legs. So, if you were training with good volume but you felt horrible towards the end of your peak races, you may need to access both the intensity and volume of your program to allow for more recovery during next season. Struggling up the climbs, especially in the first half of your races, is a clear sign that more hill and muscle endurance training is needed. Longer duration force efforts, along with an increase in overall aerobic endurance will allow you to work fast up a climb on race day. If you felt strong and fast on the climbs, then your weakness is speed. Maintaining your current strength while incorporating more speed work will help you make the climbs a little faster. How efficient did you feel in each race? Efficiency is related to technique, sport specific strength, and weight. A lack of efficiency will make you feel clumsy, such as mashing the pedals on the bike, an erratic cadence or running with greater upper torso twisting. Recognizing this and correcting it with more focus on technique, and core strength is key. The faster your core muscles fatigue in a race, the less efficient you will become. Everyone responds to training and racing differently. Looking back on your year will help you learn where you need to focus training and what adjustments need to be made in order to improve. Let’s take a look at a few important aspects of programming that can be analyzed to learn from. Studying the trends between the amount of volume and intensity of training compared to the time it takes you to recover will teach you how much you can handle or how much you need. When large amounts of training stress is still present after 2-3 weeks from a block of training or a priority race, you may have pushed too hard in terms of the volume or intensity you were training with. On the flip side, not enough volume or intensity may lead to great feeling legs in training, but horrible feeling legs in the race. Speed work, intensity, and volume all must be balanced in order to get you to race day in peak form. Learn how long it takes for you to reach peak fitness. This is a big learning tool for the upcoming season – to know when to start your training and when to plan for a peak race performance. If you timed it right and felt great in each peak race, then look back and learn exactly what you did from the volume and type of intensity to how you performed your taper into race day. You may never peak for every race exactly the same, but learning from your success will give you a good idea of what works for you. If you fell short of feeling peaked for your priority race, then learn from it. Figure out why- whether it was a lack of training, the timing of your taper or a lack of intensity in your program. Every season provides an opportunity to learn. There are so many things to analyze, from comparing results to how you mentally handled the season. Start with the big picture and answer the simple questions first. Then dive into the details with power and speed. Think hard to recognize your weaknesses and make small adjustments in training moving forward. Most importantly, set a goal to track every day and keep good notes to look back on and learn from.